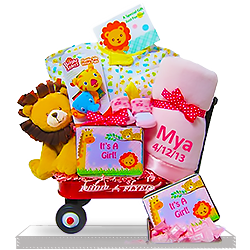 A precious plush, pink and white stork graces this special delivery basket. She has a new bundle of joy in tow, too--a new baby girl! 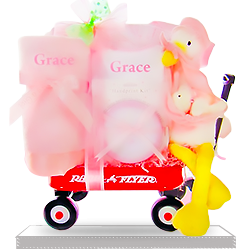 All wrapped up in pink atop a Radio Flyer wagon, are plenty of special gifts for the new arrival. 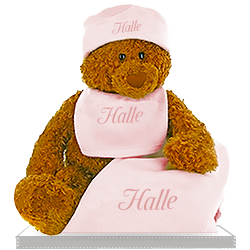 A personalized 30 x 40 plush blanket and a personalized terry cloth bib start off the list. Also included are a cotton bodysuit and a onesie. A tin that is covered in little pink hand prints will be perfect in the baby's room. Recipients loved it! She was pleasantly surprised to receive this gift. It is so beautiful... Arrived promptly. Everyone happy. Very nice! My friend loved it and it was delivered on time. New parents said it was the best gift ever! 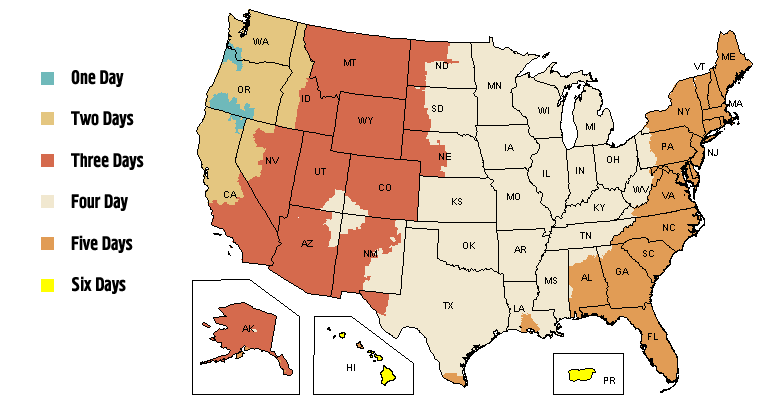 Easy to use website and excellent customer service. Will certainly use again. Much more than expected! 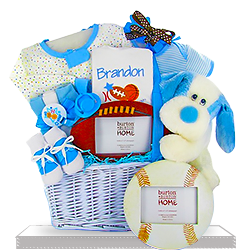 This is the second time I have ordered from giftbaskets4baby. My recipient was completely satisfied and I was happy I sent it! Thanks for delivering it exactly when it was promised and for doing such a great job. Speedy delivery...conscientious customer service. This is what will keep me coming back! I am a long time customer. Everything was good. No problems. While I did not see it personally, my recipient was very pleased. Our friends were quite surprised and love this gift. Great job! I will be ordering from you again in the future! I couldn't find any better gift. This was a wonderful present for brother's family. So cute and romantic! I fall in love with this plush stork holding such a cutie tiny baby bear! 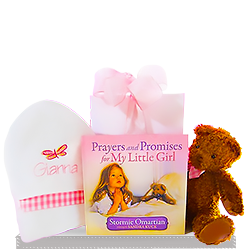 Lovely gift for baby girl! Recipients were overjoyed! Strongly recommend! It was an amazing gift for my friend’s little daughter but I would like to be bigger for that price. This lovely basket was presented to us by my MIL right in our daughter’s first birthday. It looked very nice and all the items inside were of a high quality.